Compete in a knight's tournament (Raingutter Regatta) with other Cub Scouts! This is a Cub Scouts racing event that is the sailboat equivalent of the pinewood derby. When they arrive, Scouts will receive a simple kit which they'll build, decorate and race with their friends. Cub Scouts who have not already received these will be presented them at this pack meeting. There are many new summer adventures listed in the new books. When your son receives his handbook, he can get started on advancement. Please let me know if your Cub Scout will (or won't) attend with Scoutbook's RSVP feature. We'll need to order boat kits and set aside handbooks, neckerchiefs and slides. How does "Cubs In Shining Armor" relate to this point of the Scout Law? A Scout knows good manners make it easier for people to get along together. 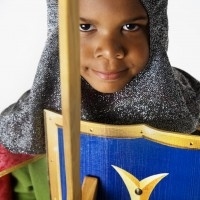 The word "courteous" is an old English word that comes from the time of knights. Many associate chivalry and graciousness with a knight in shining armor because of their code of conduct. The knight's code of conduct extols these virtues, ensuring that a Cub Scout in shining armor will exhibit courtesy to all. We hope you'll join us for this first pack meeting in the brand-new Cub Scouts program!